We reported on the launch of Scribd, the “YouTube For Documents” a little over two weeks ago. The site drew a significant amount of traffic at launch. Unlike most startups, though, that traffic didn’t just vaporize after a day or two. 100,000 or so unique visitors come the site daily. 12,000 documents have been uploaded to 8,600 unique accounts (35% anonymous). The team says the site’s traffic has been about an even split between U.S. and non-U.S. visitors (and about half of the documents are non-English). One prolific member, Builder (Bill Allin), has 113 documents to his account. One of these, “Why Intelligent People Tend To Be Unhappy”, was so popular that it got on Digg and was mentioned on Adam Corolla’s morning show. Scribd is an example of a small startup doing many things right. They created a naturally viral product and made it ridiculously easy to use. Posting and viewing can be done anonymously. More interesting documents get voted to the top for discovery by more users. It also seems to be very Google-friendly – many documents are working their way up in search results. Copyright holders have been complaining, though. Twenty five DMCA take-down notices have been made against the site to date. In each case the documents were promptly taken down and things ended amicably. However, a noticeable amount of copyrighted material remains on the site, and Scribd has hired Wilson Sonsini Goodrich & Rosati (the same firm retained by YouTube) to defend them on copyright matters. Compared with YouTube, Scribd is better suited to deal with any ensuing complaints. The sheer volume of personally written works on people’s computers will make it easier to not depend on illegally copied works. Copyright violating text-based documents are also easier to detect than rich content. Scribd will be releasing some new features to improve the user experience, including adjustable embed sizing, groups, and private documents. 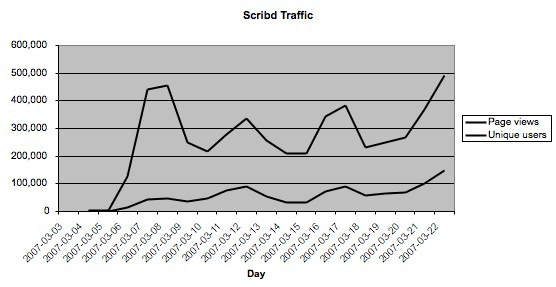 Below is a graph showing Scribd’s internal traffic numbers since launch. These internal Scribd stats track Alexa data fairly closely. The company a Y Combinator company founded by Trip Adler, Jared Friedman, and Tikhon Bernstam.